Speaking to ITV News on Wednesday, he said he wanted to see the suspects "brought to justice". The two suspects, believed to have been using aliases, travelled on Russian passports and are thought to be aged about 40. The BBC's security correspondent Gordon Corera said he understood the authorities identified the pair "a while back" and "may also know their real names" and had hoped by not making this information public, they could intercept them should they continue to travel. He said there was little expectation that the pair would end up in a British court, but releasing the evidence would instead add pressure with the intention of "deterring Russia from doing something similar again". "We must now step up our collective efforts specifically against the GRU," Mrs May said on Wednesday. She condemned the "despicable attack" and promised "the full range of tools from across our national security apparatus" would be used to "counter the threat" caused by Russia. Responding in a statement, Russia's London embassy called on the British government to "give up politicised public accusations". The embassy statement accused the UK authorities of being unwilling to engage with them, by providing additional information about the suspects such as their passport numbers. Labour leader Jeremy Corbyn said the use of military-grade nerve agent on the streets of Britain was an "outrage and beyond reckless". Russian President Vladimir Putin's foreign policy adviser Yuri Ushakov told reporters the names of the Russian suspects "do not mean anything to me". But BBC diplomatic correspondent James Landale said many European countries would be "reluctant to tighten the screw on Russia", fearing a loss of trade and energy. Sue Hemming, CPS director of legal services, said there was enough evidence "to provide a realistic prospect of conviction" and that it was "clearly in the public interest" to bring charges. Scotland Yard's Neil Basu, the head of UK counter-terrorism policing, said that Det Sgt Bailey "continues to make good progress but remains off work". 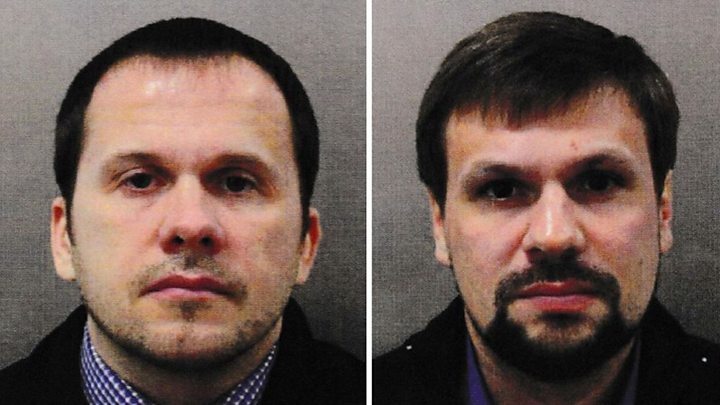 The decision to identify two named Russian individuals in the Skripal case as agents of the Military Intelligence Service - the GRU - is a significant development. It raises the level of evidence on which the UK government's charges are based and potentially gives added weight to calls for additional international sanctions against Moscow. This evidence will be presented to the UN Security Council later this week. Already messages have been exchanged between London and Moscow; the British Ambassador there seeing a senior Russian official and a Russian diplomat going into the foreign office here in London. But given that it is highly unlikely that these men will ever face trial, what happens now? 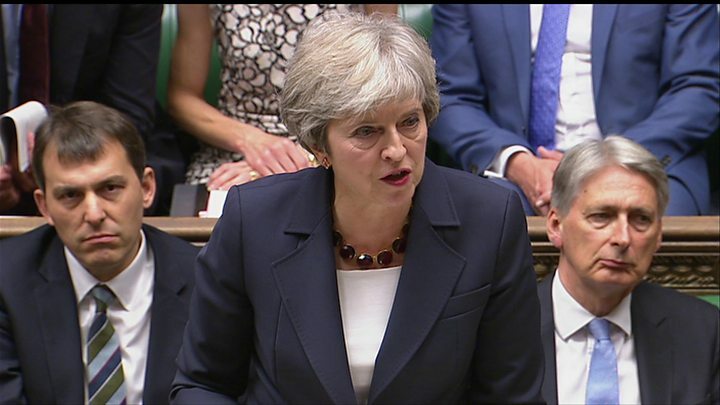 The prime minister put her emphasis upon bolstering western democracies' defences - not just in purely military terms, but specifically in countering the powerful intelligence arm of the Russian armed forces, the GRU. On 4 March they travelled to Salisbury - having also visited for reconnaissance the previous day - where Mr Skripal's front door was contaminated with Novichok. While traces of Novichok were found in the London hotel room, there is no risk to other guests who were staying at the hotel at the time, police said. They now want to hear from anyone who was a guest there from 4 March to 4 May. London Mayor Sadiq Khan said he had been assured there was no risk to public health in London. Mr Rowley told police he found the box containing the small bottle and an applicator - all found to be counterfeit - in a charity bin. Image caption The counterfeit perfume bottle recovered from Mr Rowley's home and the box police say it came in. The bottle, with a modified nozzle, had contained a "significant amount" of Novichok, Scotland Yard said. Mr Basu said: "We don't yet know where the suspects disposed of the Novichok they used to attack the door, where Dawn and Charlie got the bottle that poisoned them, or if it is the same bottle used in both poisonings." But he added that the adapted bottle and packaging made it "a perfect cover for smuggling the weapon into the country, and a perfect delivery method for the attack against the Skripal's front door". Mr Basu confirmed the two poisoning cases were related. "It now forms one investigation," he said. "We do not believe Dawn and Charlie were deliberately targeted, but became victims as a result of the recklessness in which such a toxic nerve agent was disposed of."